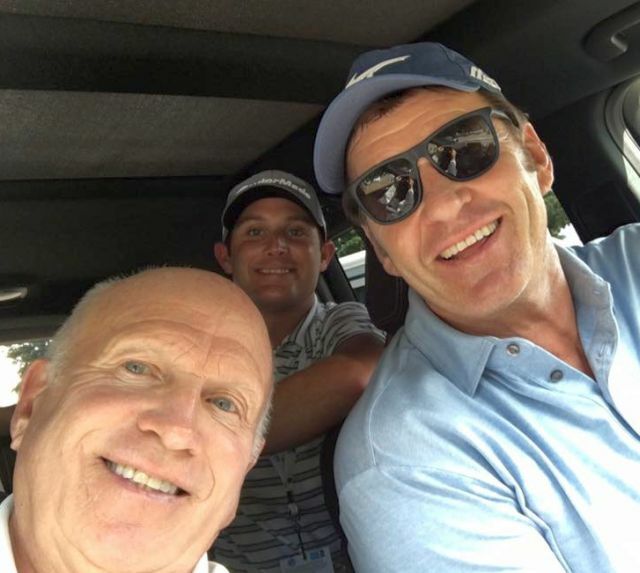 Nick Faldo and "Tee it High and Let it Fly." Everyone has their own routine or way of going about getting ready to hit the ball. Your routine usually fits your personality and temperament. Engineers or left brain thinkers tend to be process focused and will think a bit more about what they need to do to strike the ball. Artists or right brain thinkers tend to be more feel oriented than mechanical. Which one is correct? Both are correct depending on the individual! For those who watched Nick Faldo play in his prime, you realized he was very structured and almost robotic in his approach to playing golf. He was a tactician as he calculated and maneuvered his way around the golf course. Kiddingly his fellow competitors said his every move on and off the golf course was choreographed by his instructor at the time, David Leadbetter. Nick had full trust in Ledbetter's advice and followed it to the letter, first because it fit his personality and second because it worked. In late 1995, Nick contacted Dr. Craig Farnsworth for a full day putting lesson. They arranged to meet at Lake Nona Country Club in Orlando in November. The first part of the day was spent indoors testing Nick's eye sight and then having him perform numerous exercises that Craig had created. I was in the area that week playing in a tournament and was fortunate to be invited (I asked) to watch the second half of the putting lesson in the afternoon. Nick was the number 1 player in the world, but most would say he was just an average putter at best. During the four hours on the putting green, I never was confident he was going to make a putt! Much of the work that afternoon was establishing a routine and letting his eyes see the line and trusting his technique. His putting was mechanically driven. That's OK for mediocre results, but not for world class success. Craigie must have convinced him, because Nick's putting improved steadily the next year and culminated in an impressive putting exhibition as Faldo won the 1996 Masters Championship, which Nick gave due credit to Craig for his help. A very interesting conversation took place during that afternoon in Orlando. Craigie asked Nick to describe his pre-shot routine for a full shot. His explanation was mechanical, precise with rigid steps leading up to him taking the club away from the ball. He did visualize the type of shot that the situation dictated, but then planned what body movements were needed to execute the shot properly. Then he said a most telling thing! He said, "Once I put the club behind the ball I see where I want the ball to go and swing!" So, Mr. Mechanical really wasn't as mechanical as it seemed! When this was pointed out to him, he answered quickly, "You can't think about mechanics when you are swinging." But it had creeped in with his putting. There are just so many things that we can have control over. We take lessons and improve our swings. We practice to make our shots more consistent. We then have to trust the work that we have put in will translate to good shots on the golf course. So as Bobby Jones said, "After taking the stance, it is too late to worry. The only thing to do then is to hit the ball." So follow the old golf adage, "Tee it high and let it fly!"